Welcome to Ignite 360 Storymasters! We’re glad you’re here! We are excited to share our storytelling expertise with you! From the steps to construct a compelling narrative to unconventional ways to tell a story – and how to hurdle over stumbling blocks along the way, we want to help you elevate your story game in 2019! On this page you will find all the Storymasters series content hot off the presses! You can also check back here to catch up on anything you may have missed. To ensure you get the most from your Storymasters experience, we want to get a sense of where you’re starting from with regards to storytelling. Thank you for your feedback on the Storymasters Series! Please rate each of the following statements on the scale below from strongly disagree to strongly agree. We appreciate you taking the time to send us your feedback! We are here to help you succeed. Please feel free to drop us a line at storymasters@ignite-360.com. We developed this guide full of ideas and tips to help you overcome the overwhelming feelings and pain points of writing your story. From sorting out what’s important to your storyline and finding your Big Idea to examples of headlines that stick! 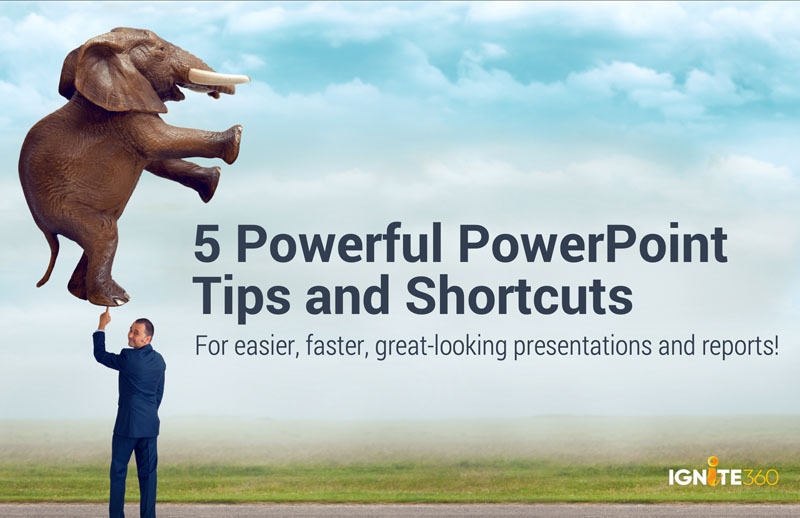 Not everyone has a designer on retainer – so we put together 5 of our most used (and powerful) PowerPoint tips you can use to perfectly polish your presentation and impress your audience in record time! Storymasters The Webinar - Harnessing the Power of Story to Drive Action for Your Business. One of the most fun hours you’ll spend on your journey to become a storymaster! In this webinar, we’ll dig deeper into the foundational storytelling concepts that drive your business to action! Hosts Rob Volpe, CEO and Lisa Osborne, COO will share real examples and anecdotes of how storytelling will elevate your insights - and answer your most burning questions real time! The Storymasters guide contains an overview of the 10 storytelling concepts in this Storymasters series, real-world challenges and solutions you can begin to use right away, actual case studies and examples of storytelling in action PLUS links to additional learning content! Let’s chat! We’d love to hear from you with any questions, business challenges or just to say hi.